1.That most mattress manufactures use chemicals and harmful toxins in their mattresses. 2.They use these chemicals for fire retardants which is required by law. 3.It is legal to use harmful chemicals and toxins in mattresses. 4.Most top retailers and wholesale clubs will not tell you this info. 5.The mattress in your home may have these chemicals or toxins in it. What can you do to prevent this from happening to you and your family. That's easy just a little research on the internet. We have a complete line of organic mattresses which have no harmful toxins or chemicals and they are very comfortable. We have organic mattresses for kids and adults. 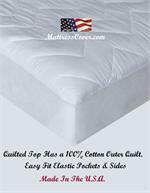 Our all natural organic mattresses are built to order. We will select the perfect combination materials that will fit your comfort needs. If you have any questions feel free to email, call us 1800 205 8003 or stop into our Yonkers, New York showroom to find the healthiest and most comfortable mattress for you and your family. Thank-you for looking at our products. All Natural Super Comfortable 100% Organic Cotton Quilt Fire Retardant is wool rinsed in salt water Filled with layers of 100% Talalay Latex No chemicals No Toxins. Made In The U.S.A.